Turkish Airlines Euroleague newcomer PGE Turow Zgorzelec added some bulk to its frontcourt Friday by signing big man Vlad Moldoveanu, the recent MVP of the Estonian League finals. Moldoveanu (2.06 meters, 26 years old) arrives from BC Kalev/Cramo, where he won the Estonian League title in their only season together. In Eurocup play last season, Moldoveanu scored 10.7 points and pulled 4.6 rebounds starting part-time in 10 regular season games. He had debuted in the Eurocup in 2010-11 with Benetton Treviso of Italy, posting averages of 8.2 points and 2.8 rebounds. Before Benetton, he had split a four-year university career between George Mason and American in the United States. After Benetton, he played for Le Havre in France, averaging 12.3 points and 5 rebounds in the 2012-13 season. He also plays for the national team of his native Romania. 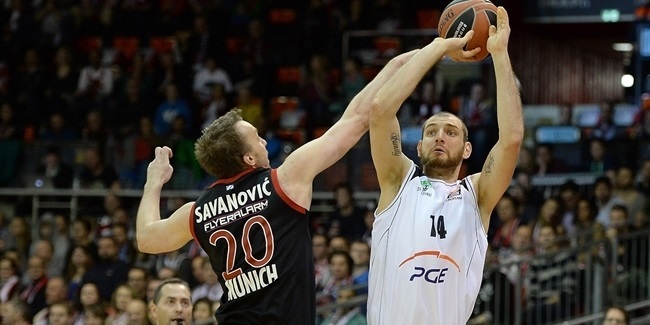 Moldoveanu will make his Euroleague debut with Turow.